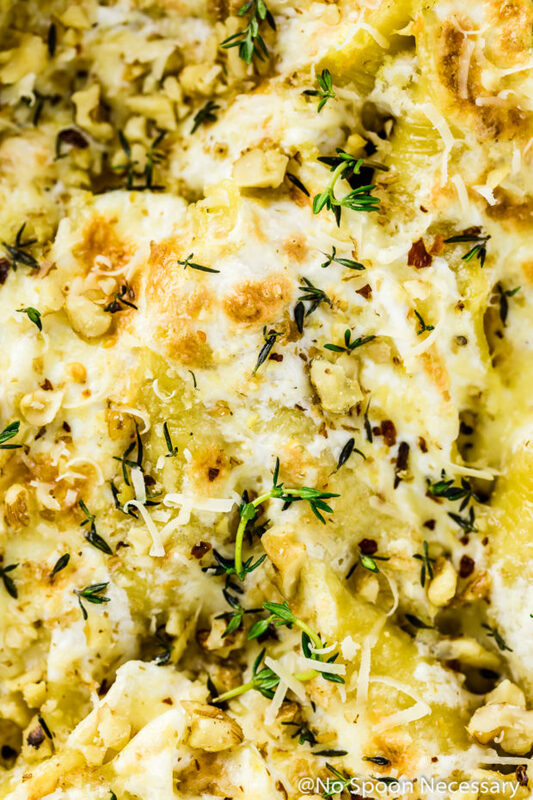 These Baked Pumpkin Stuffed Shells with Burrata are fall comfort food at its finest! 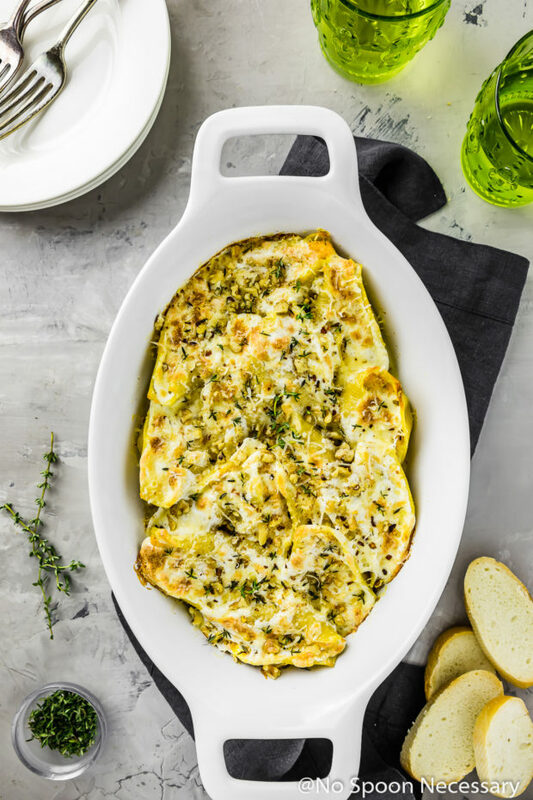 Tender jumbo pasta shells are generously stuffed with a mix of creamy ricotta, savory pumpkin and fresh herbs; then topped with rich Alfredo sauce, decadent burrata and baked until bubbly. 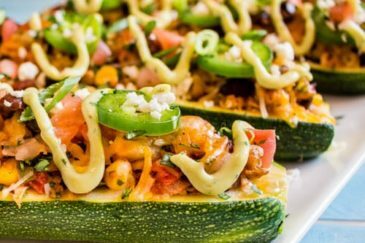 It’s an insanely delicious twist on traditional stuffed shells! This post was originally published in October 2017. I edited the photos and updated the post below to include more information about these Alfredo pumpkin stuffed shells. 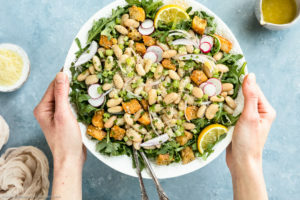 Plus, I added a recipe video to show you how easy this dish is to make! Put on your sisterhood of the traveling pants, because we are going to mentally time travel for 4.56 seconds. Let’s take it back to approximately 2 years ago. Do you remember how I said I didn’t like pumpkin in THIS post? You all were all flabbergasted and said I was a bad person? Then, do you remember how I updated that same exact post with a recipe video a few weeks ago? I suppose if you are one of those people who loves technicalities, theoretically I said I didn’t like pumpkin AGAIN. Well, if you ask me the second time shouldn’t really count, because I never changed or updated the actual written words in that post. Pumpkin and I are OFFICIALLY on the road to becoming fast and furious besties. This should come as no shock if you read the title of today’s recipe. And, for the record, these shells are what changed my mind (forever and EVER) about pumpkin. 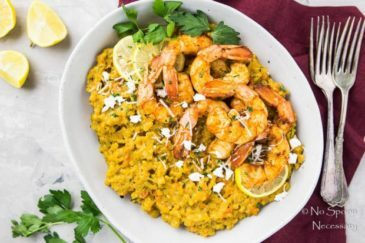 AKA my new all-time favorite dish for fall! 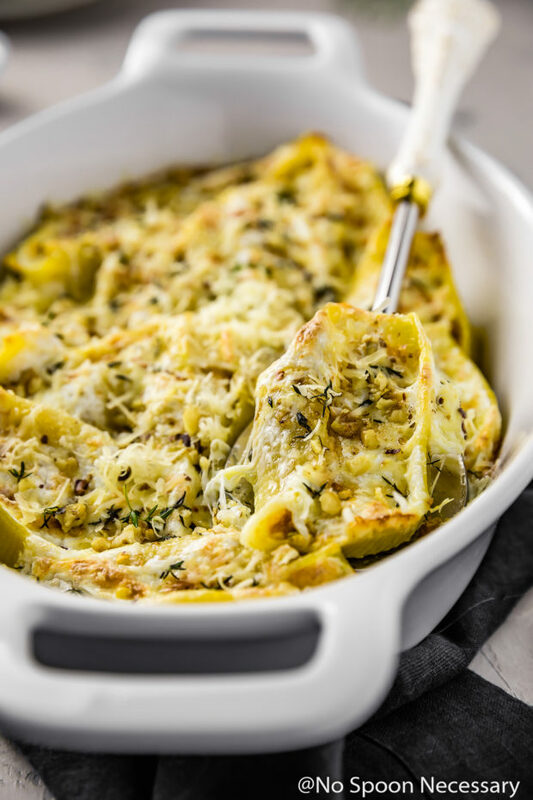 Tender pasta shells stuffed to the gills with a mix of creamy ricotta, savory pumpkin, warm spices, fresh herbs and a touch of tart lemon. Scattered with salty parmesan, then generously dotted with rich, decadent burrata and baked until melted and bubbly. 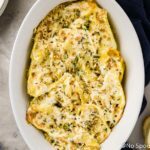 These Baked Pumpkin & Burrata Stuffed Shells are the definition of comforting eats and they are just perfect for fall! And, if you wanna get really crazy with it, and by crazy I mean crazy delicious, you can add Alfredo sauce to the top of the shells before baking. The result?! 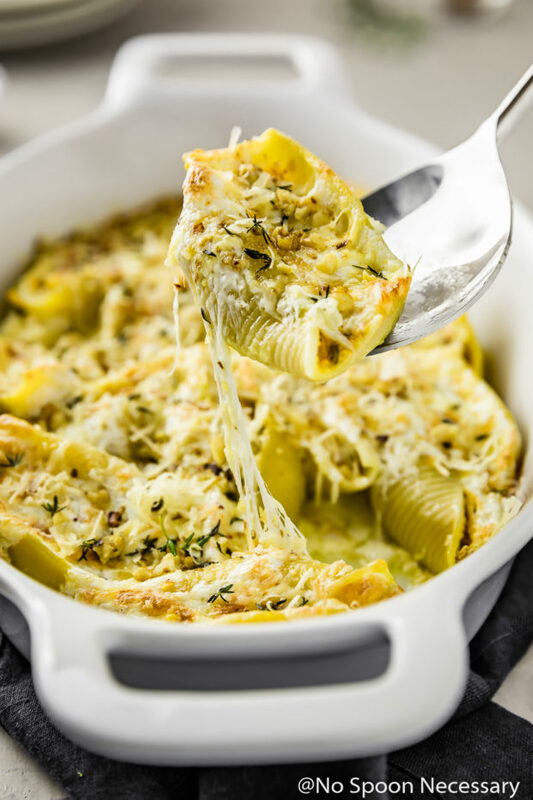 Insanely creamy, cheesy stuffed shells that will rock your world! Trust me when I say you NEED this! Because carbs on carbs = ALL THE YUM. What sides go with stuffed shells? What to serve with stuffed shells? Stuffed shells are a heavy and filling dish, but that doesn’t mean you have to eat them plain! 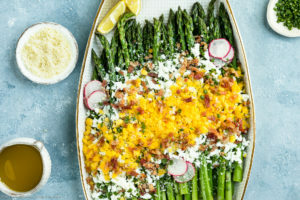 These baked stuffed shells pair excellently with a light side salad or roasted seasonal vegetables if you are looking for something a bit more substantial! As well, I’m a firm believer you just can’t have cheesy, baked stuffed shells without some crusty artisan bread or a toasted garlic bread! Yes! You can absolutely freeze stuffed shells! To freeze these pumpkin stuffed shells, simply cook the pasta, make the filling and then stuff the shells. Instead of proceeding with the recipe and baking the shells, transfer the stuffed shells to an un-greased, or wax-paper lined sheet pan. Cover the shells with plastic wrap and transfer the pan to the freezer. Once the shells are completely frozen, transfer them to a freezer safe zip-closure bag and store in the freezer until ready to use. Alternatively, you arrange the pumpkin shells into a baking dish, cover tightly with plastic wrap, and then with aluminum foil and freeze. 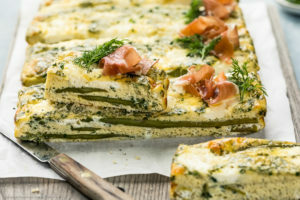 To use the frozen shells, allow them to defrost in the refrigerator overnight and then proceed with the recipe as written. You can either make your own pumpkin puree or used the canned variety. Just make sure you do NOT purchase canned pumpkin pie filling! It is NOT the same thing as pumpkin puree! Make sure you are properly salting your water for cooking the pasta. For the recipe below, use 1 tablespoon of kosher salt and 4 quarts of water. AFTER the water has come to a rolling boil, stir in the salt. 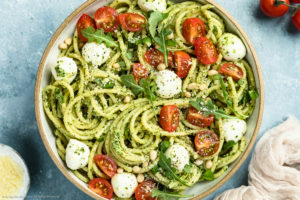 Just as properly salting your pasta water is important, so is cooking your pasta shells until BARELY al dente, which is approximately 9 minutes. The shells will continue to cook in the oven, so it is imperative you do NOT overcook them!! The pumpkin shells can be prepared, through step 3, a day in advance. Simply stuff the shells with the pumpkin mixture, but do not top them with the burrata or parmesan. Cover the baking dish tightly with plastic wrap and store it in the refrigerator. 30 minutes prior to baking, remove the dish from the oven and place it on the counter to remove the chill. Top the shells with both cheeses and continue with the recipe as instructed. If you like a more golden brown color and slight crispness to the top of your cheesy shells, I highly recommend you switch the oven to broil during the last 2-3 minutes of baking. Just make sure you watch the oven VERY carefully!! Things can go from perfect to burnt in a matter of seconds! Until next week, friends, cheers – to sensational stuffed shells. 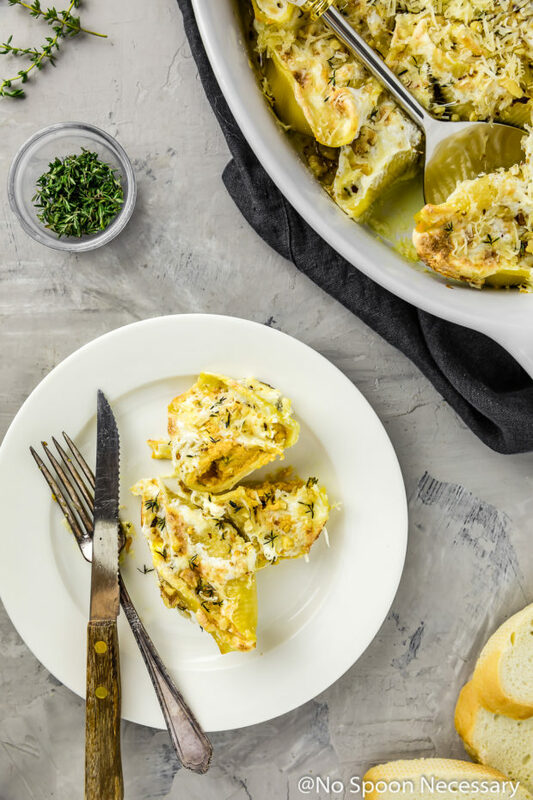 These Baked Pumpkin Stuffed Shells with Burrata are fall comfort food at its finest! Tender jumbo pasta shells are generously stuffed with a mix of creamy ricotta, savory pumpkin and fresh herbs; then topped with rich burrata and baked until bubbly. It's a decadent and insanely delicious twist on traditional stuffed shells! 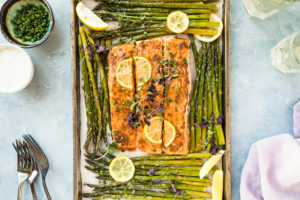 Preheat oven to 350 degrees F. Lightly coat an 8x11-inch baking dish with nonstick cooking spray. OPTIONAL - If using Alfredo sauce, spread 3/4 of a cup Alfredo sauce in the bottom of the baking dish. Set aside. Cook the pasta: Bring a large pot of salted water to a boil and season generously with salt*. Add the shells. Cook pasta according to package directions until barely al dente, about 9 minutes. Drain the pasta (and drizzle with olive oil if desired) and set aside to cool. 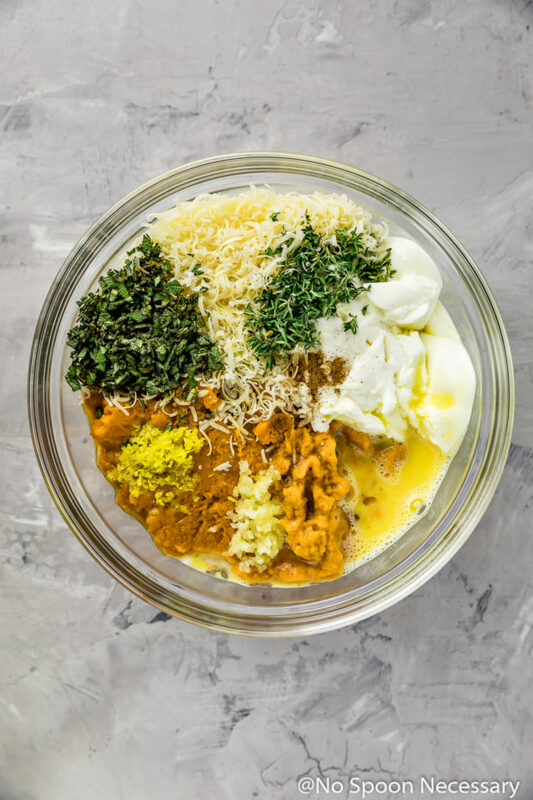 Make the filling: In a large bowl, combine the pumpkin puree, 1 cup of parmesan, ricotta, egg, garlic, sage, thyme, lemon juice, lemon zest and nutmeg. Season with salt and pepper to taste. Stuff shells: Fill each cooked shell with about 2 tablespoons of the pumpkin mixture. Arrange the shells snuggly into the prepared baking dish (filling side up). OPTIONAL - If using Alfredo sauce, evenly pour the remaining sauce over the shells. Tear the balls of burrata over top of the shells, allowing the burrata filling to spill onto the shells. 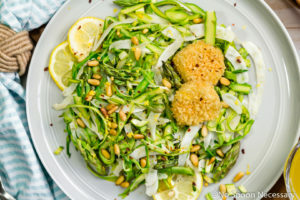 Sprinkle with the remaining ¼ cup parmesan cheese. Bake: Transfer to the oven and bake for 30-35 minutes, or until golden brown and bubbly*. Let cool for 5 minutes before topping with optional garnishes and serving. Enjoy! You can either make your own pumpkin puree or used the canned variety. Just make sure you do NOT purchase canned pumpkin pie filling!! It is NOT the same thing as pumpkin puree! Make sure you are properly salting your water for cooking the pasta. Use 1 tablespoon of kosher salt and 4 quarts of water. AFTER the water has come to a rolling boil, stir in the salt. The stuffed shells can be prepared, through step 3, a day in advance. 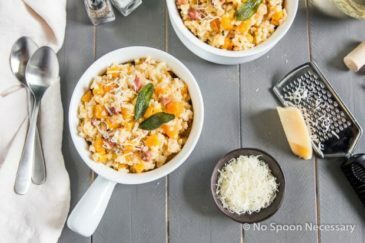 Simply stuff the shells with the pumpkin mixture, but do not top them with the Alfredo, burrata or parmesan. Cover the baking dish tightly with plastic wrap and store it in the refrigerator. 30 minutes prior to baking, remove the dish from the oven and place it on the counter to remove the chill. Top the shells with both cheeses and continue with the recipe as instructed. *Nutritional information does not include optional Alfredo sauce. Thats so funny. My boyfriend claimed for years that he didn’t like pumpkin. Now he loves it, however, still won’t actually admit it. Anyways, this is an amazing recipe. I want to be eating this so bad right now. 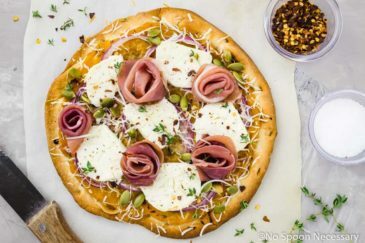 So creamy and delicious with fall flavors! All the savory flavors compliment one another well, perfect dish to warm up with on a cold day! I remember these from the first time around and I’m still drooling! I’m a HUGE stuffed shells fan, and these are so perfect for fall Chey!! So perfect for a fall get together with friends! Mu boyfriend has exclaimed to me several times over the years that he hates pumpkin, yet more recently has decide he loves pumpkin bread, pumpkin cheesecake, and pumpkin pasta. Go figure, I guess our tastes just change! I, on the other hand always have and always will (I guess unless my tastes change???) love pumpkin. These stuffed shells sound divine. 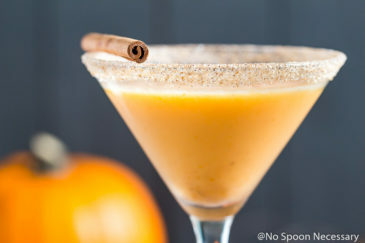 I love the flavors of pumpkin and sage together, especially with a spattering of nutmeg. Good stuff. Plus, well, cheese. You amaze me with the simplicity and also the complexity of flavors for your dishes. YUM. 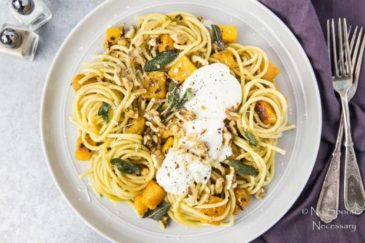 I wonder if I can get my kids to like pumpkin with this recipe as it is cleverly mixed with pasta shells (which they love) and burrata. Great Scott! Deliciousness at its finest.